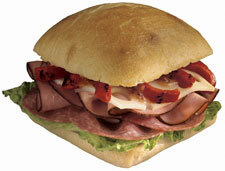 Wendy's has added another sandwich to their Frescata line-up. 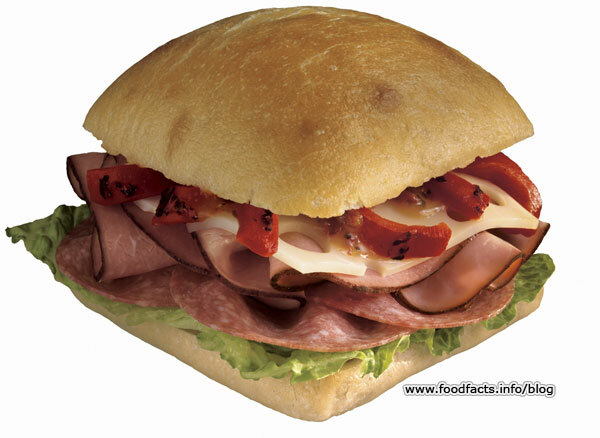 The Frescata Italiana is made with "Black Forest ham, Genoa salami, Swiss cheese, Romaine lettuce and roasted red peppers on freshly-baked artisan bread with sun-dried tomato vinaigrette dressing." It's worth noting that unlike the 2 other new sandwiches we've looked at this week (from Hardee's and Jack) this one has zero trans fats and quite a few less calories, too. So unlike McDonald's, Wendy's is sticking to their trans fat pledge. On the other hand, I was disappointed to see HFCS as an ingredient again. This time it's in the sandwich's Sundried Tomato Vinaigrette. Wendy's Frescata Italiana has 520 calories, 230 calories from fat, 25 g fat, 9 g saturated fat, 0 g trans fat, 90 mg cholesterol, 1540 mg sodium, 49 g carbs, 4 g fiber, 6 g sugars, 26 g protein. The sandwich will be available through September. It's priced at $3.49 la carte, or $4.99 as a combo choice. National advertising starts on Sept. 4th. These are dry and tasteless sandwiches. It was good and didn't taste non-healthy. Overpriced, tiny, stale, and bland. Even worse than the fiesta whopper. Less flavor than your average napkin. On the bright side, food this bad tends to be healthy.